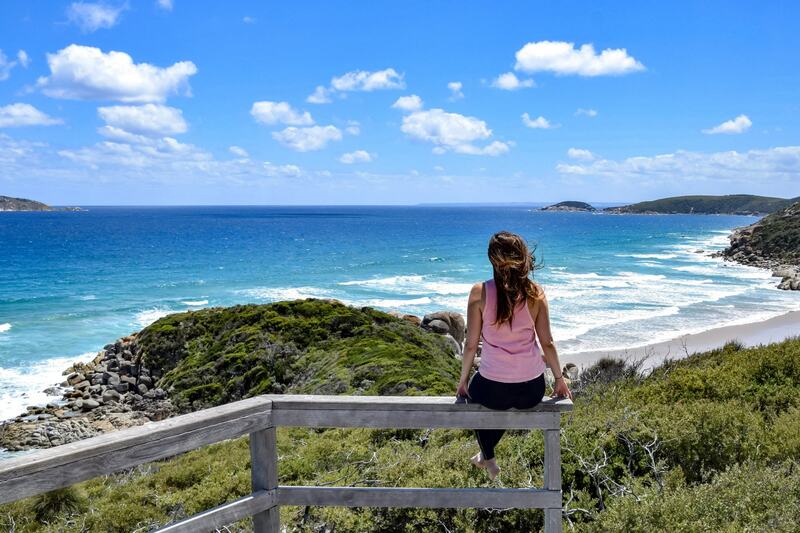 Despite Wilsons Promontory being located just 3 hours from Melbourne and one of the most beautiful parks in Victoria, neither one of us had ever visited the national park before. This might be because we’d always just been focused on other places, or maybe because the cooler weather reports down there often scare me off, but over the summer we finally managed to get down there and explore this unique part of Victoria. 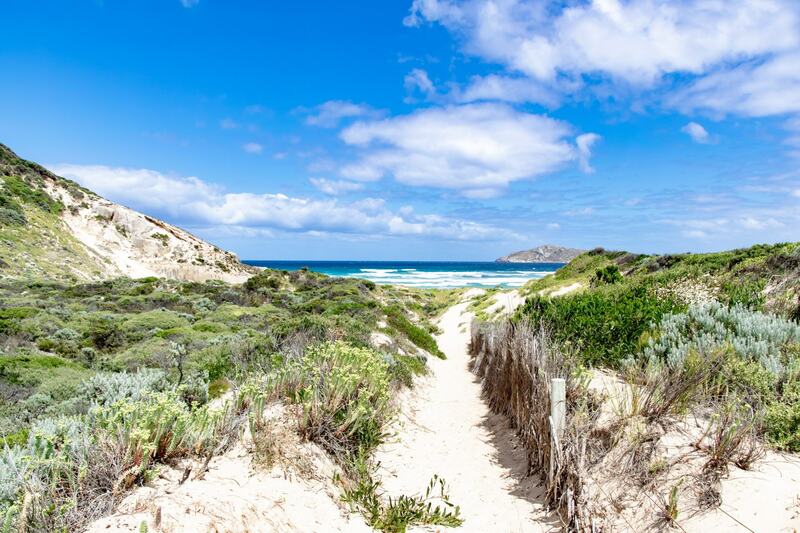 Located at the southernmost tip of Australia’s mainland, Wilsons Promontory offers visitors a little bit of everything. There are beautiful white sand beaches, stunning coastlines, thick bushland, huge granite mountains and an abundance of native wildlife. There is enough to keep you busy if you want to visit for one day or one week, with bushwalks and hiking of all different durations, difficulties and lengths, wildlife spotting locations, and even sand dunes that you can ride down if you’re game enough. We spent the whole day in Wilsons Prom, exploring lots of the short walks and as many of the beaches as we could before the dusk started to settle in. 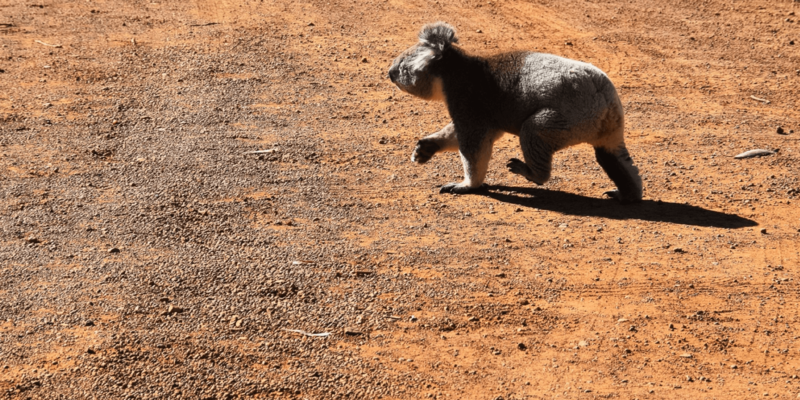 I was on the hunt to spot my first ever wild wombat in the park, and although I didn’t spot any on this visit we did see kanagroos, wallabies and even an emu walking around amongst the bushland. 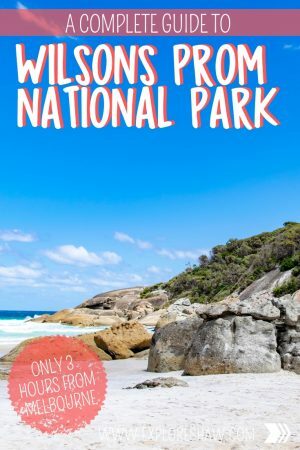 Here is absolutely everything you need to know for your visit to Wilsons Promontory National Park. 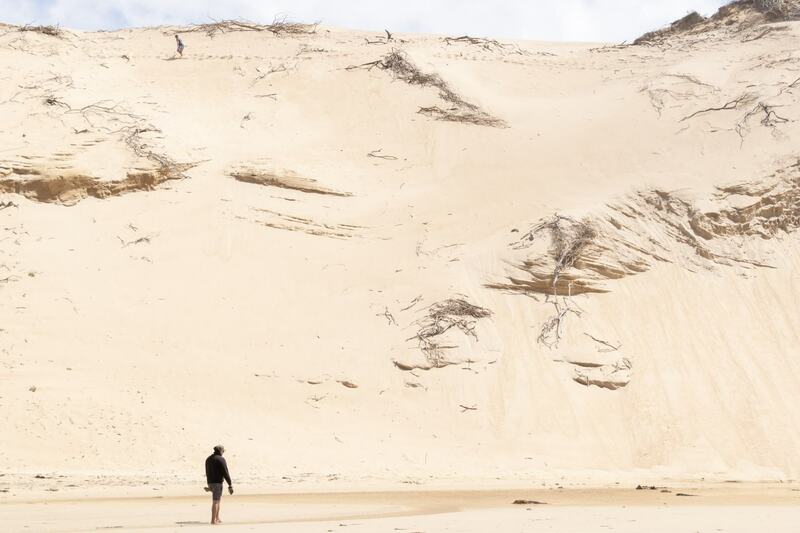 Summer is the most popular time to visit Wilsons Prom, but to be honest it’s a little bit crazy. 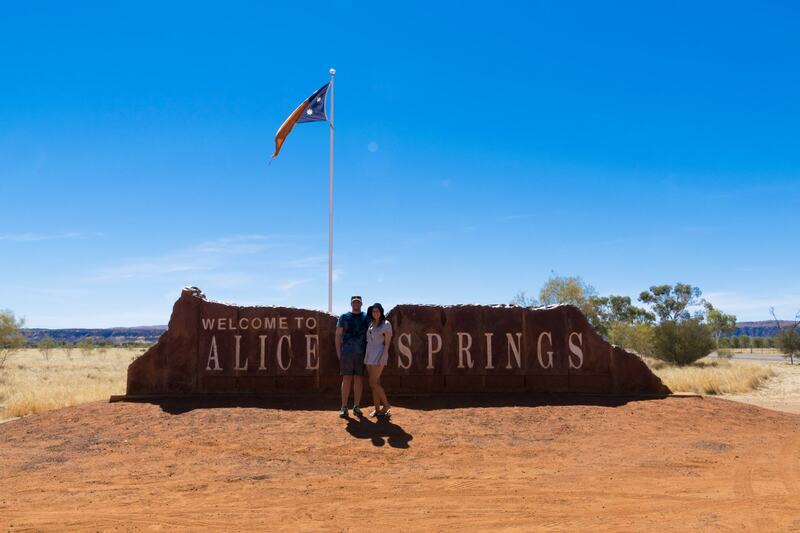 With people taking advantage of the warmer weather and the school holidays, there are always heaps of people around and it can be very difficult to find accommodation and camping sites within the park. However, Wilsons Prom weather is always a little bit cooler than Melbourne which means even during the summer time it’s normally only mildly warm, and winters can be freezing. So if you’re always chasing the sun like we are, it can seem unappealing to visit during the winter months. Try visiting during the shoulder months, like February, March, October and November for the best experience. The weather is still a little warmer during this time, but there are fewer crowds once schools have gone back. If you’re after a wildlife experience, make sure you arrive around dawn in the morning and don’t leave right until dusk, as this is when the wildlife in the park are the most active. Remember to be very careful driving during these times though. For our visit to Wilsons Prom we stayed at Toora Tourist Park, which is located just 30 minutes away from the national park. This quiet caravan park was one of the best we have stayed in, with lovely large grassy campsites, clean, modern amenities and lots of extra facilities. They have a huge indoor kitchen and dining area, as well as an outdoor BBQ and picnic area, games and TV room and even a function room. So good for big groups or family reunions! They’re also super family-friendly and have heaps of activities to keep the kids entertained for hours, including playgrounds, mini-golf, a jumping pillow, trampoline, heated indoor pool and spa, a tennis court and even giant chess. WOW. 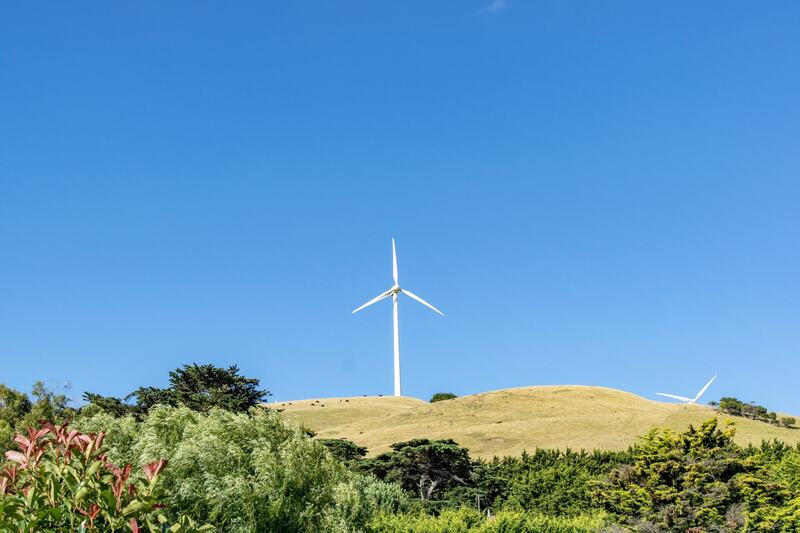 From our camp site we could see the turbines from the nearby wind farm standing tall on the mountains behind us. It was such a lovely spot to spend a couple of nights, and Toora also had the prettiest sunsets, which was quite unexpected! Toora Tourist Park is also a member of Top Parks, a huge network of holiday parks around Australia that boast more parks in more places, and more pet friendly parks than anyone else. We actually stayed in 3 Top Parks locations on our trip around Victoria and they were all fantastic! 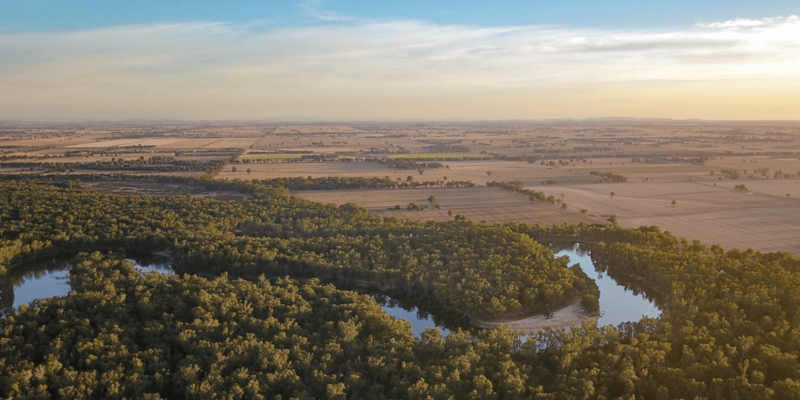 If you’re planning on visiting a few Top Parks locations on your travels around Aus, it’s a great idea to join their G’DAY Rewards Program, which offers mates rates at over 270 parks around Australia. For all Top Parks locations or to join the G’DAY Rewards Program, head to www.topparks.com.au. This little country town had everything we could have wanted for our stay, including a pub, a grocery store and a pharmacy, which came in extremely handy when I woke up a little bit under the weather on the day we were leaving. Right across the road from the caravan park you can find Latte Dah, which was a fantastic cafe that we ended up visiting quite a few times. They offer a great menu of breakfast and lunches, as well as delicious coffee, snacks and cakes. If you’re looking for a great lunch spot, Gurney’s Cider is around 10 minutes from Toora Tourist Park, and offers local Gippsland cider. Head there for an afternoon of great drinks, paired with one of their grazing plates or cheeseboards. In addition to being just 30 minutes from Wilsons Prom, Toora Tourist Park is also just 10 minutes from good fishing spots, 10 minutes to Anges Falls and the Toora Wind Farms, and 20 minutes to beautiful surf beaches. Day visitor entry to Wilsons Prom is free. When you get to the front gate you will be given a map and some general info and then you’re free to explore the park at your leisure. It’s important that all day visitors exit the park prior to sunset, as this is when the local wildlife is the most active and accidents are more likely to occur. If you’re overnight hiking you will need to obtain a campsite permit from the Visitors Centre in Tidal River, before you set out on your hike. If you arrive after hours and have not organised your permit in advance you are not allowed to start hiking, and will need to wait to grab a permit the next day. There is no fuel anywhere within Wilsons Promontory National Park. The closest fuel station can be found at Yanakie, just before you enter the national park and about a 35 minute drive from Tidal River. A free shuttle bus operates between Tidal River and Telegraph Saddle during the summer and Easter school holidays, and on weekends from November to April. You can jump on the bus from either the Tidal River Visitors Centre car park, the overnight hikers car park and the Telegraph Saddle car park. The bus timetable is posted at all bus stops and departure locations, as well as at the Visitors Centre. The Telegraph Saddle car park is closed to vehicle access when the shuttle bus is in operation. The Mount Oberon Summit walk is meant to be one of the best in the park, offering stunning panoramic views over Tidal River and the nearby islands after climbing to a rocky summit. The walk is 3.4km long and is a little bit difficult, but the views can’t be beat. For a bit of a longer walk check out the Sealers Track, which will climb you up to Windy Saddle and then back down through the dense forest connecting you to the boardwalk over Sealers Swamp and finally getting you to Sealers Cove. This track is about 9.5km and is of moderate difficulty. Another highlight accessible by a longer hike is Tongue Point, which is the end of several different walking tracks including the ones starting at Darby River (3.8km to Tongue Point) and Darby Saddle (5.6km to Tongue Point). No matter which track you choose, they both take you through the beautiful diverse landscapes of the park, passing lookouts, coves and offering island views. 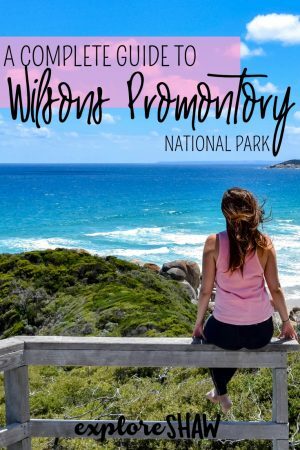 For those of you that are serious hikers, Wilsons Promontory also has a range of overnight hikes, so you can spend even more time in nature and exploring every corner of the park. The northern part of Wilsons Prom is classified as a wilderness zone and there is an emphasis on preservation and conservation. 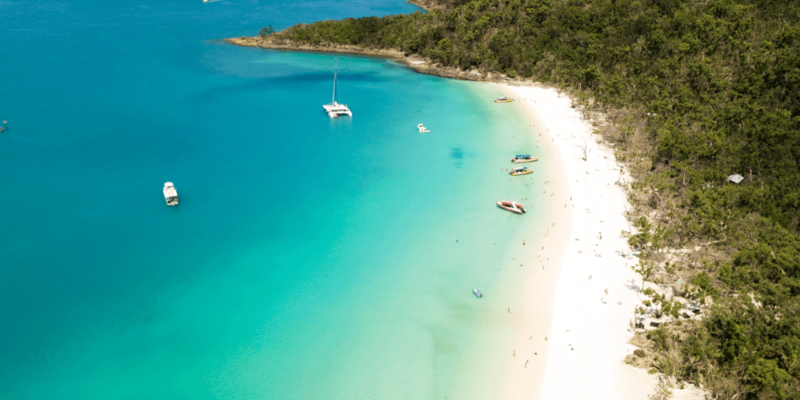 There are five overnight campsites in the northern wilderness, located at Barry Creek, Lower Barry Creek, Five Mile Beach, Tin Mine Cove and Johnny Souey Cove. These campsites have no facilities though, so this is a real wilderness experience. 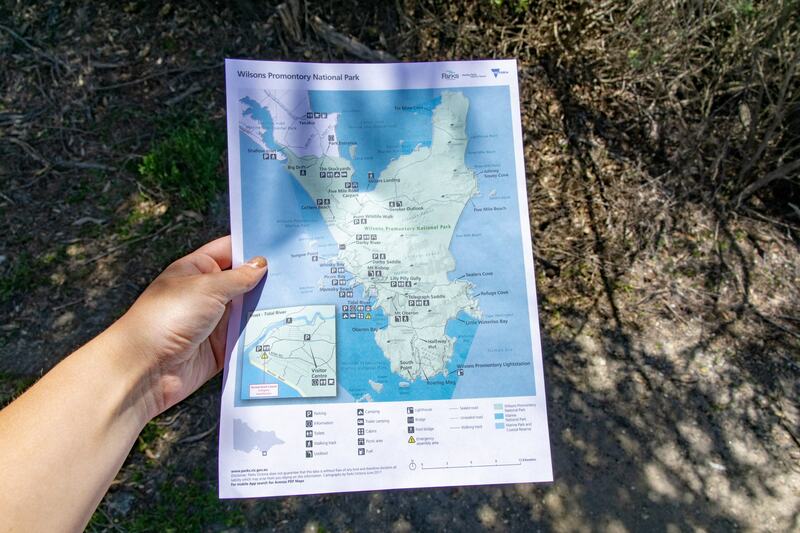 Make sure you check out the Parks Vic website for all conditions of walking these tracks. On the southern side of Wilsons Prom there are a number of different walks that you can take that lead you to different beaches and locations around the park. 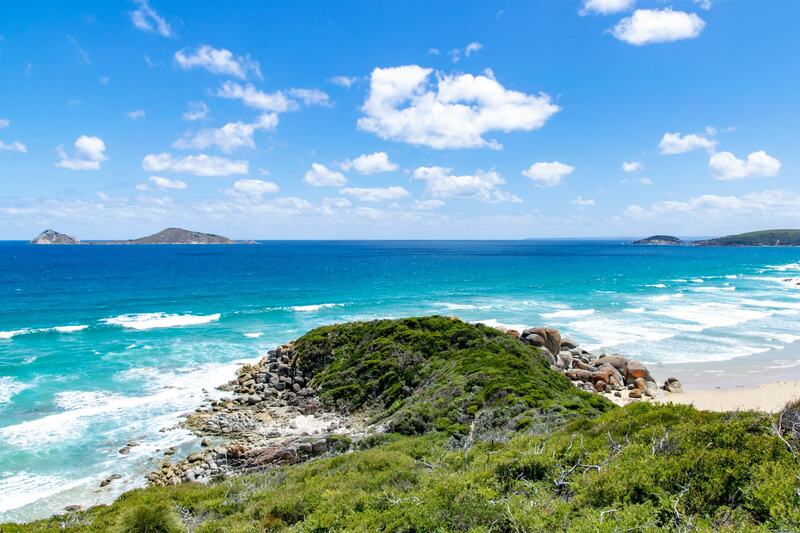 From either the Tidal River or Telegraph Saddle car park you can access Sealers Cove, Refuge Cove, Little Waterloo Bay, Roaring Meg, Halfway Hut, Oberon Bay and the Wilsons Promontory Lighthouse. Some of these locations are available on a day walk, although it would be a pretty big day so it’s important that you’re prepared! Otherwise you can stop for the night before heading back to Tidal River. The Complete Southern Prom Hike will take you past all of the southern sites, to some of the prettiest beaches in the park. 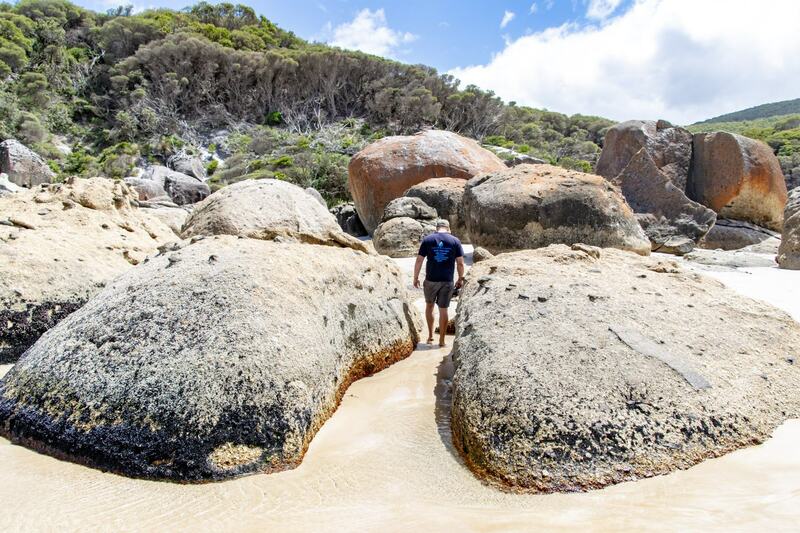 From Tidal River the overnight trail takes you to Sealers Cove via Oberon Bay, Little Waterloo Bay and Refuge Cove. The entire walk stretches for 60.4km and takes about 20 hours, so it’s recommended that you stretch the walk over 4 – 5 nights. Check out more information about the Southern Prom Hikes here. You can only stay at an overnight hike location for a maximum of two nights, where there are only basic camping facilities on offer, including untreated water and composting toilets. Don’t forget, you will need to bring your own toilet paper and drinking water! If you’re planning to embark on any of these hikes you will need to purchase an overnight hiking permit which costs $13.60 per person. It’s important that you keep your permit on you at all times. If long overnight hikes aren’t really your thing, there are still a bunch of great short walks that you can take around Wilsons Prom. 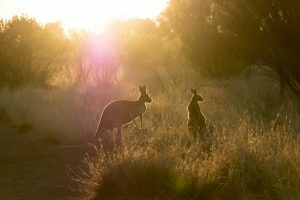 Although they are short, they are no less impressive, leading to beautiful beaches, bushland views and the homes of the local wildlife. From the Darby River car park, follow the sandy track along the river until you wind your way around to Darby Beach. A short 1.1km from the car park, this walk is mostly flat, although most of the path is covered with a thick layer of sand. 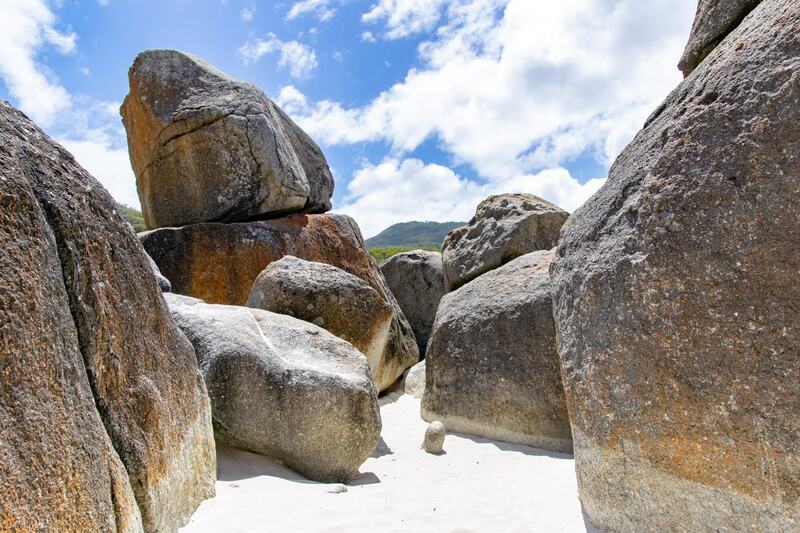 There are actually two short walks that can take you to Squeaky Beach, one of the most famous beaches in the park. The Squeaky Beach Track starts at the Tidal River footbridge, and offers stunning coastal views as you wind around it’s 2.1km track. 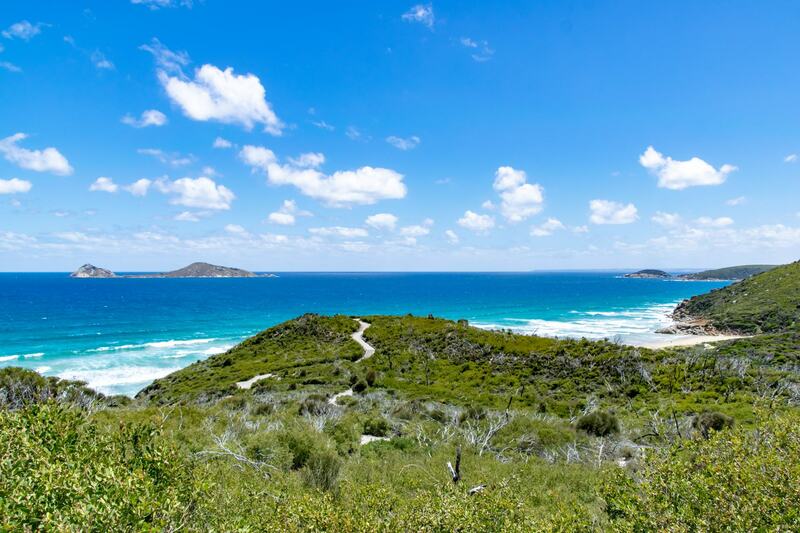 It also offers some of the best views of Squeaky Beach as you climb over the headland that separates Leonard and Norman Bays. The second walk also takes you via Picnic Bay, combining two of the best beaches in this side of the park as it leads you to Squeaky Beach. Just an extra 400m, than the original walk, it’s definitely worth adding the beautiful Picnic Bay into your day. You can also take a walk between Picnic Bay and Whiskey Bay, that almost feels like a walk straight across a 700m viewing platform. The views here are absolutely beautiful, with a lookout in the middle that offers you the best views of both bays. 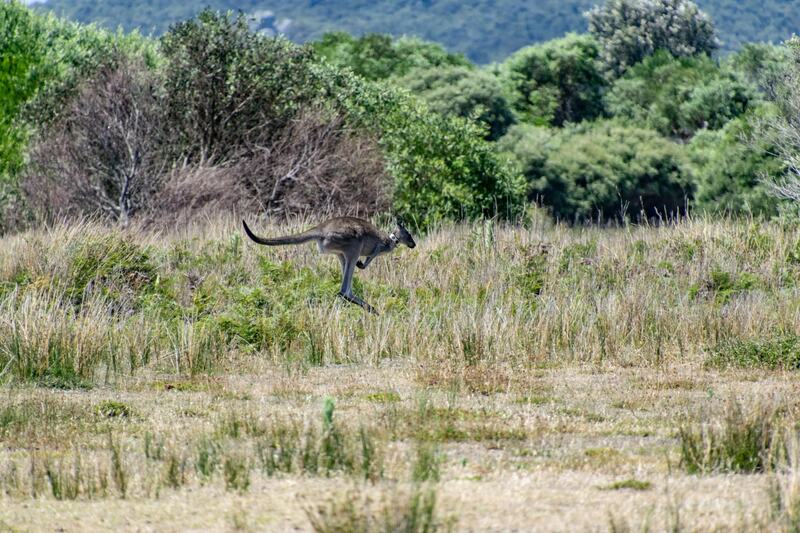 Prom Wildlife Walk offers the best opportunity to spot native wildlife, including kangaroos, wallabies, emus and wombats. 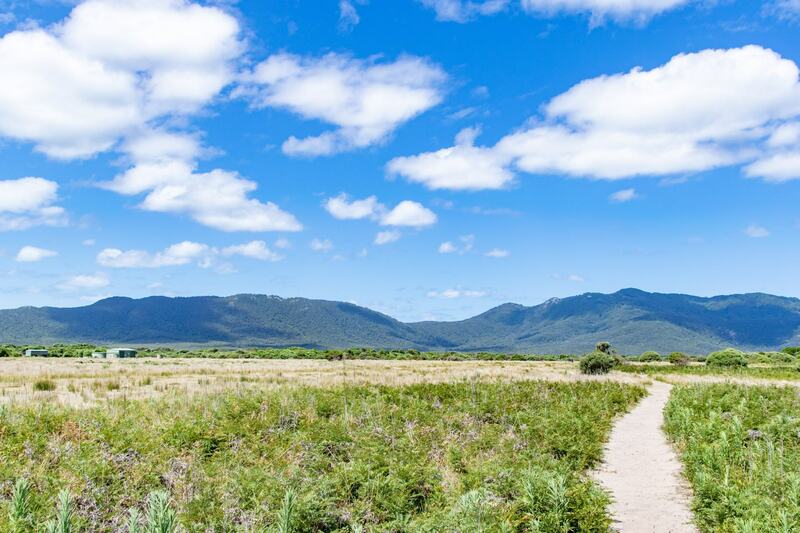 The 2.3km return circuit is a nice easy walk, offering a trip into some of the bushland of Wilsons Prom. You can find out about all the shorts walks around Wilsons Prom here and here, including distances, duration and levels of difficulty. 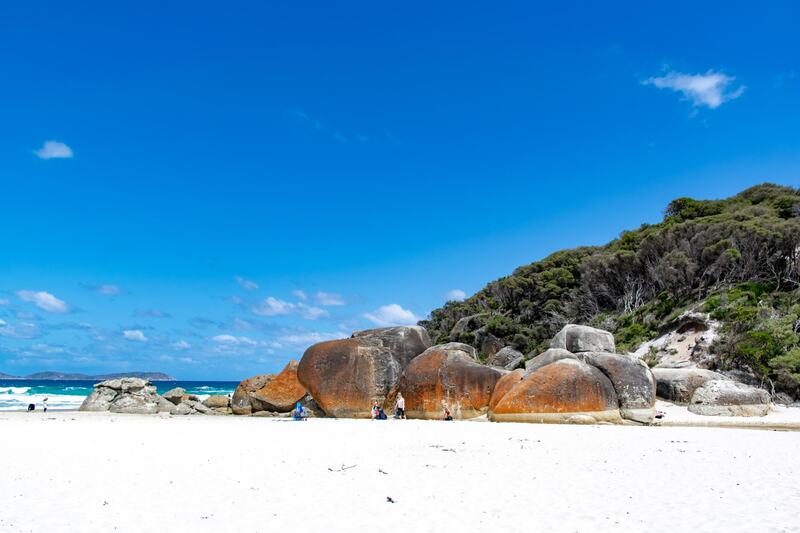 Some of the best beaches in Wilsons Prom are only a short walk from the car park, and offer some of Victoria’s most gorgeous white sand beaches. Many of the beaches in the area do have strong undertows and ocean rips that can carry your out to sea or into the rocky cliffs that surround the coast if you’re not being careful. Always make sure you are confident swimming, as most beaches are not supervised by lifesavers. 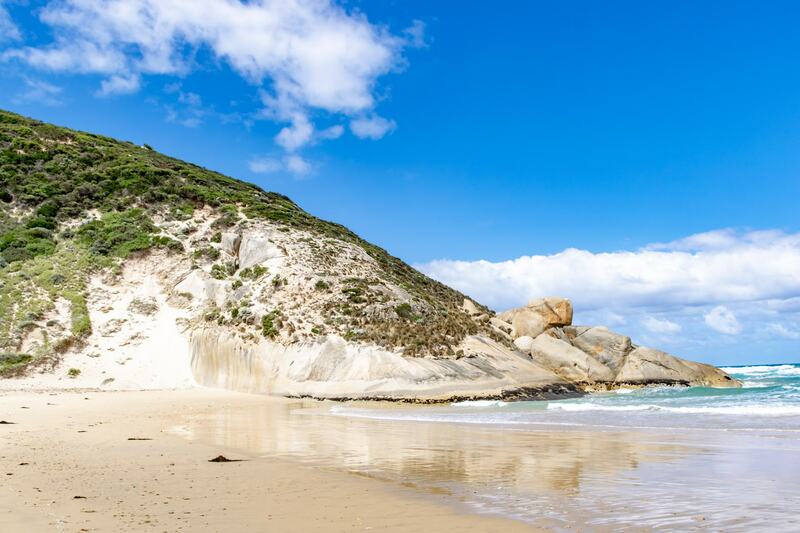 Squeaky Beach – only 300m from the car park, where the white sand literally squeaks under your feet as you walk across it. Whisky Bay – only 400m from the car park, Whisky Bay is sheltered by the sandy cliffs that surround the bay, with lookouts offering the best views when you’re coming from Picnic Bay. 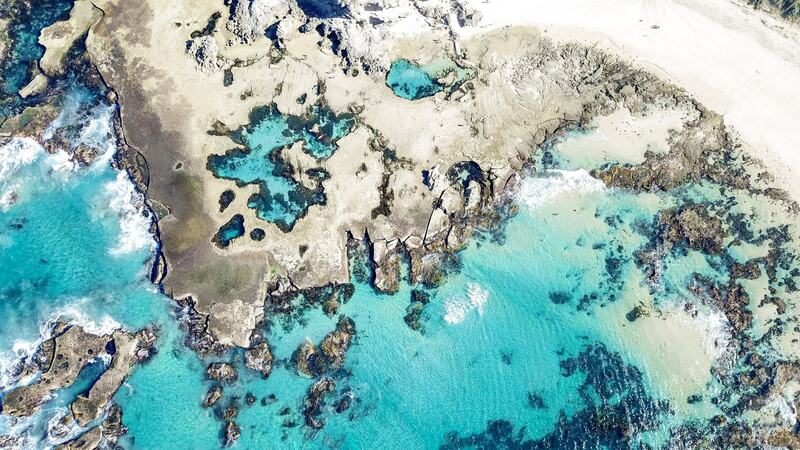 Picnic Bay – only 400m from the car park, there are all kinds of rock pools to explore at Picnic Bay. Tidal River is one of the main areas in Wilsons Prom, found right at the end of Wilsons Promontory Road. Here you can find the Tidal River Visitors Centre, where you can get all the info and advice you need on hiking or camping in the park. There’s also a small store, that’s kind of a mixture between a grocery store and a gift shop, where you can find snacks, drinks and essentials like sunscreen and aeroguard if you’ve forgotten to bring them with you. Right next door you can also find a take away shop, offering meals, snacks and hot food. You can also find toilets and showers in Tidal River, as well as fresh drinking water, picnic areas, free gas BBQs and mobile device charging stations. The Tidal River Visitors Centre is open from 8:30am until 4pm, or 4:30pm during daylight savings. Tidal River is the main area to camp in Wilsons Promontory, with the exception of the camp sites for overnight hikers that can be found around the park. During peak periods it’s highly recommended that you book your campsite in advance. 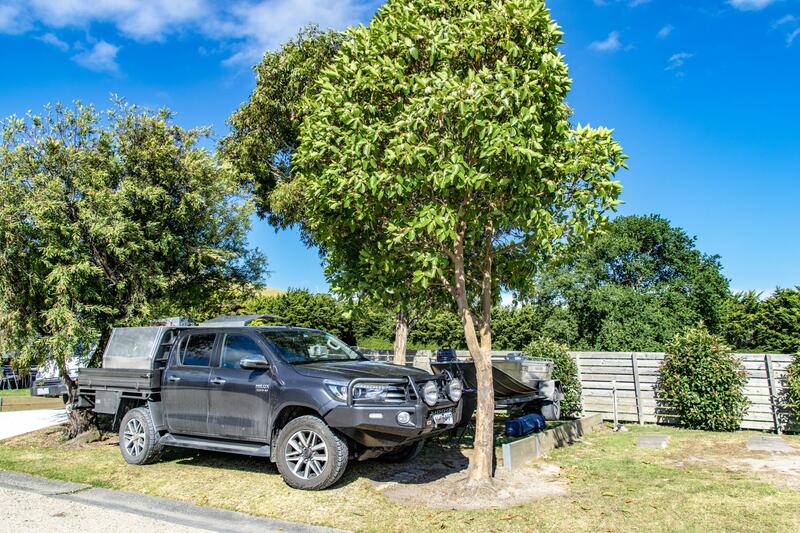 During most of the year, the campsites at Tidal River are unallocated and work on a first come, first choice basis – although they still do require a booking. However, in the summer school holidays, Easter and most long weekends, the campsites are allocated and must be applied for through the ballot system well in advance. There are only 20 powered campsites at Tidal River, as well as 484 unpowered campsites and fees to apply for all sites at the campgrounds. The permits provided give you access to the use of campground toilets, hot showers and coin operated laundry facilities for the duration of your stay. If you have pre-booked your camping or accommodation at Tidal River and arrive after hours, head to the Visitors Centre and check out their information board for check in procedures. There are also quite a few accommodation options around Tidal River if you would like to stay inside the park, including self-contained cabins, units, huts, group lodges and the Wilderness Retreat for a truly epic weekend away. The other option for camping is at the Stockyard Camp, which is located near the park entrance and also available to book outside the summer ballot and peak periods. It’s more of a bushland campground, set a little way out from the beach, although Whiskey Bay is a short drive away. 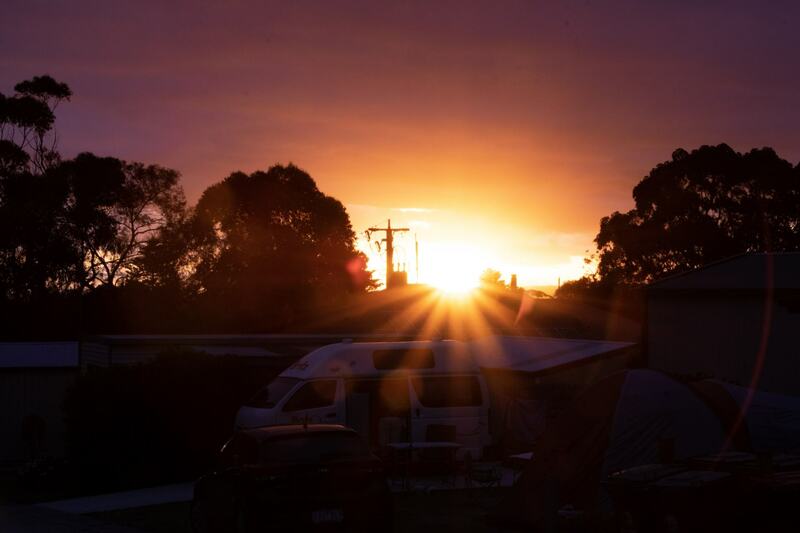 For campsite bookings and enquiries visit the accommodation and booking page or phone 13 19 63. We visited Toora Tourist Park as a guest of Top Parks. All opinions are, as always, our own.